← Everybody Wang Thai Tonight! What’s up, everybody? Welcome to another edition of Mastication Monologues! 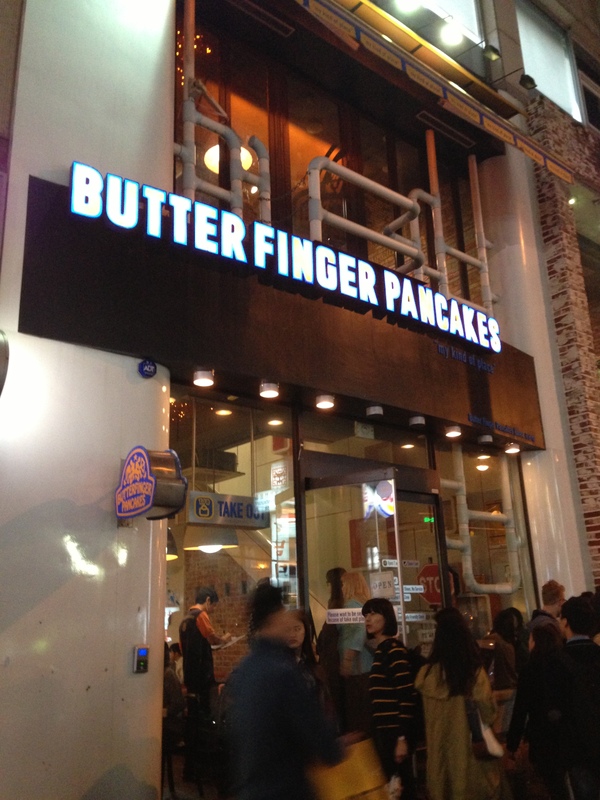 Today I’m going to be talking about a well known player on the Seoul food circuit that I finally managed to hunt down and sink my choppers into: Butterfinger Pancakes. I went to the one close to Gangnam station. Leave the station through exit #6. Walk straight ahead to the first street corner and turn left. It’s about 2 blocks down on the left next to Burger King. 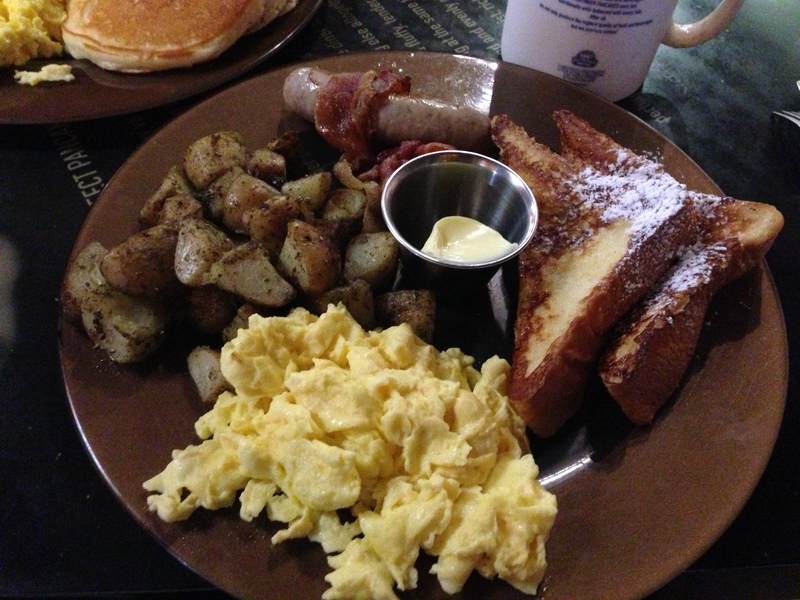 As for the hours, they’re open until 3 a.m. if you’re craving some American breakfast items. I had always heard that it pretty much was the place to go to get a taste of back home, but that it was always super busy. The night Steph and I went there was no different. We went on a Saturday night for dinner, and there still was a 15 minute wait which wasn’t too terrible. We went up to the top floor, and surprisingly it was filled with mostly Koreans. Walking past the packed tables, I could see huge plates overflowing with food that the patrons were quickly inhaling like they never saw food before. Perhaps I would have a similar experience. I knew Butterfingers meant business when I was face to face with its menu. I think they’re trying to compensate for something. It literally was larger than life just like their prices which ranged from 10,000 to 30,000 Won. 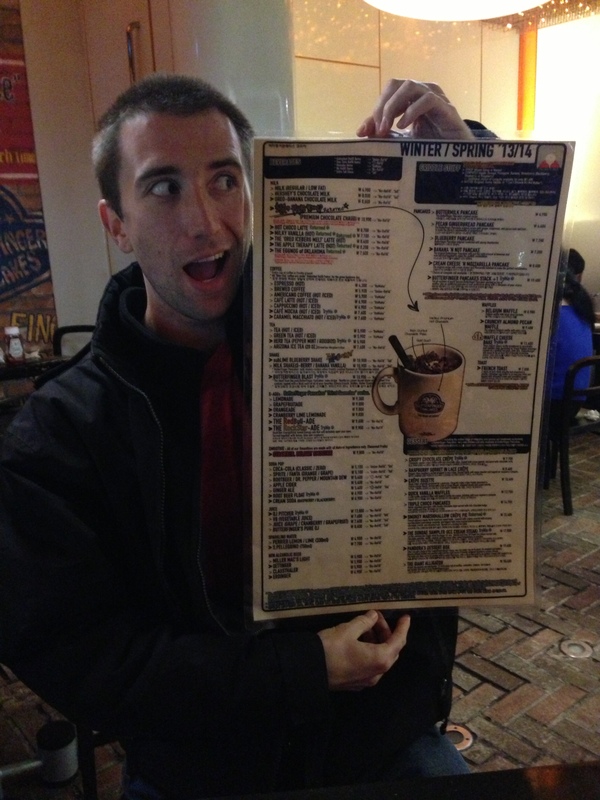 They had everything from pancakes to make your own omelet options. 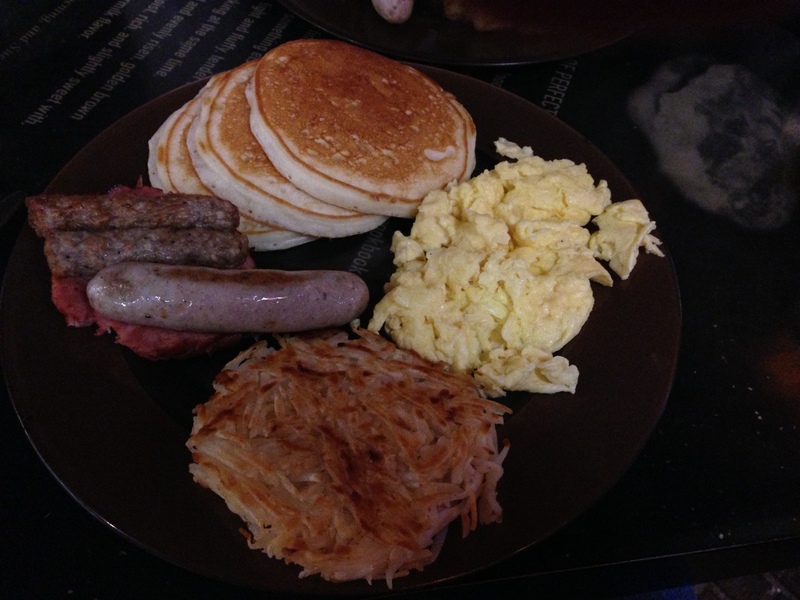 I wanted to try a little bit of everything, but I eventually went for the breakfast special (17,000 W) which contained eggs (scrambled/sunny side up/hard boiled), white sausage, ham, sausage links, hash browns, and pancakes with your choice of regular butter or vanilla butter. Steph got the French toast version of the platter. When they came out, I was taken aback at how much food there was on our plates. After living in a country where they eat kimchi and rice or maybe nothing for breakfast, this was a shock to the system. I quickly dove gob first into my meal starting with the eggs. I thought I would need some salt to make them more palatable, but I was pleased with their buttery goodness. Plus, they didn’t have that gross gelatinous texture that scrambled eggs can take on when made in restaurants like McDonalds. Next, there were the hashbrowns. 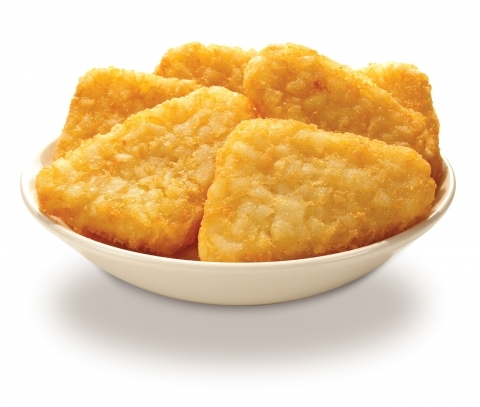 Normally, I’m all about the crispy, triangular hashbrowns and don’t care much for the shaved-taters version. However, I liked these better than how they’re normally prepared because they were squished into a thick potato-pancake of sorts that made them a lot easier to eat especially with a dollop of ketchup. The white sausage was just ok. It kind of had a hot dog flavor profile which didn’t really jive with the rest of the classic breakfast items. It was like that guy who brings Zima to a house party. True, it’s alcohol, but it should be at another party or perhaps another decade. However, the breakfast sausage links and ham were delicious and were only further enhanced through the addition of maple syrup. Nothing like a little liquid Canadian gold to make any breakfast better. Finally, there were the pancakes. I do have to say that Butterfinger Pancakes definitely lives up to their name with their mean flapjacks. They were perfectly cooked to a golden brown hue and had fluffy white insides. Taste-wise, they probably were some of the best pancakes I’ve ever had. I think what separated them from other pancakes that I’ve downed before was that they possessed a unique buttery/vanilla aftertaste that took my palate off to Paul Bunyan’s lumberjack heaven. Even though they were on the smaller side, they had enormous flavors. 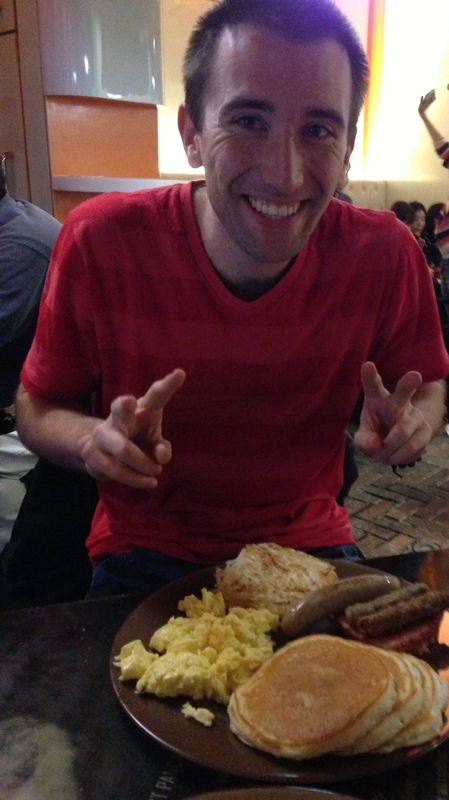 When I finished, I was satisfied, but in retrospect, it wasn’t the best breakfast overall that I’ve had. I think it was simply the fact that I haven’t had a normal American breakfast in so long that I really appreciated one when it came along. The plate I ordered you could find anywhere in America, but this was a case of distance causing the stomach to grow fonder. 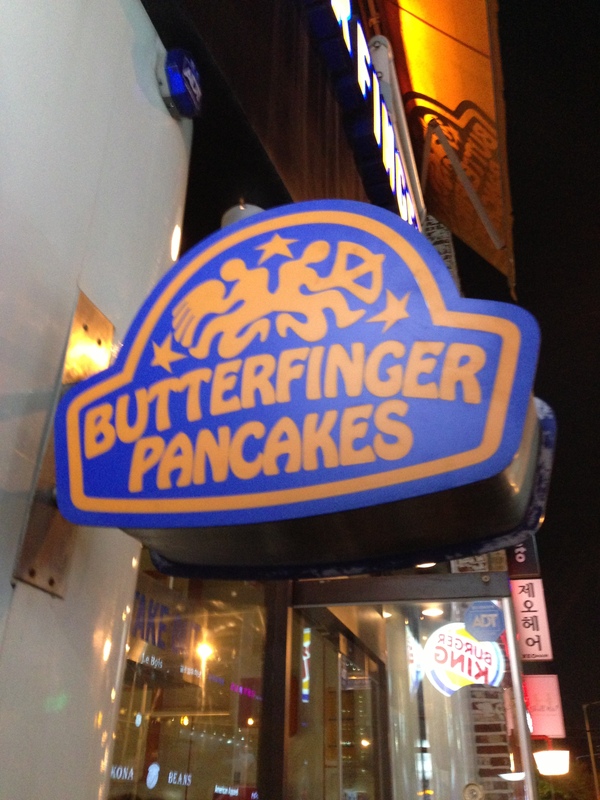 So if you are really hankering for some big breakfasts the way only the Stars and Stripes can do it, head on over the Butterfinger Pancakes in Gangnam. Posted in American Cuisine, Breakfast, Comfort Food and tagged America, breakfast, eggs, French toast, ham, hash browns, pancakes, potatoes, sausage. Bookmark the permalink. Looks like a great breakfast place, Mark. The French toast looked really good too. Another great review, keep up the good work!